2018 third-round draft pick OT Chuks Okafor seemed like a luxury pick when he was selected. Or perhaps not so much a luxury as a “Haven’t dem Stillers noticed that the problem last season was the durn defense?!! !” pick. But with the (temporary) demise of third-year tackle Jerald Hawkins during OTA (torn quad) it started to look a good deal smarter. And now G Ramon Foster, who is entering his 10th season in the NFL, is out, at least for the nonce. In Foster’s case the news is considerably better than first feared when he was taken off the field with a knee injury during the Steelers’ first padded practice on Saturday, It turns out he has a hyper-extended knee with no ligament damage, which is projected to keep him out for 4-5 weeks. Fortunately the heir apparent, YouTube star* B.J. Finney, has had a considerable number of game reps by now coming in for injured players—mainly Foster, but he also played some center last season, with mixed results. Training camp has begun. Wow. 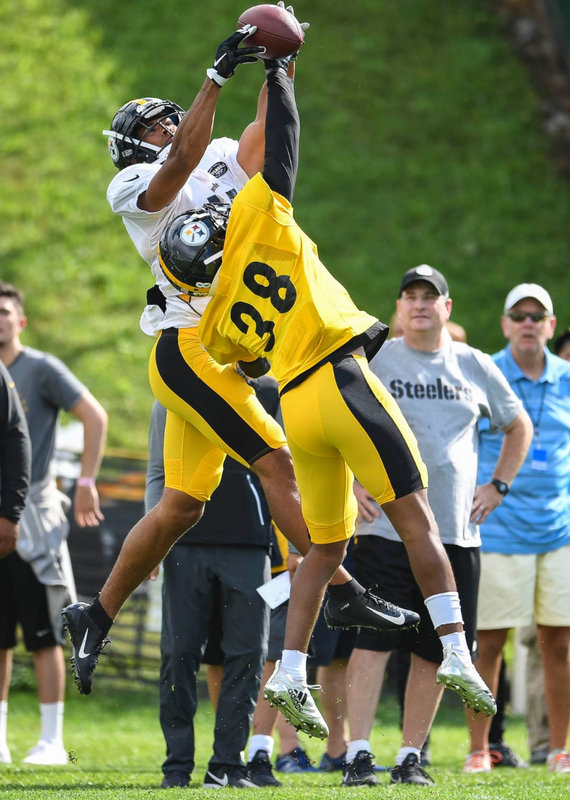 I don’t know about you all, but somehow the time between The Loss Which Shall Not Be Named (except by basically everyone writing about the Steelers) and training camp has seemed to go by in a flash. I suppose it is the Toilet Roll Effect. * So it’s time to start the intense Steelers talk, and for once let’s begin at the top, because with all due respect to Landry Jones and Mason Rudolph, it’s probable that as Ben goes, so go the Steelers. Roethlisberger hasn’t set a definitive end date for his career and said his future will depend on his health. To that end, he worked with a personal trainer in the offseason while cutting carbs and sugars from his diet. Roethlisberger smiled and politely deferred when asked about his weight.